The Checkatrade Trophy may not be a competition at the top of any manager’s list if priorites, but for both Keith Curle and Karl Robinson tonight’s clash between Oxford United and the Cobblers carries plenty of significance. Both teams are in the middle of lengthy winless runs, with the Cobblers dropping to third bottom in Sky Bet League Two at the weekend, and Oxford slumping to rock-bottom in league one, despite ending a four-match losing streak with a 0-0 draw at Southend United. Town travel to the Kassam Stadium under the stewardship of new boss Curle, who was handed the reins last Monday following the dismissal of Dean Austin, who had secured just one win in 12 matches this season. Robinson has also had a torrid time at the Kassam Stadium, with Oxford now without a win in seven matches. Indeed, they haven’t won since beating Fulham Under-21s in the Checkatrade back on September 4, one of only four wins the team has managed this season - with two of the others coming in the Carabao Cup. That means Robinson is a manager under pressure, and he will see this match against a Cobblers side without a win in eight as the ideal chance to get a crucial victory on the board. Which is exactly what Curle, who has overseen draws against Bury and Swindon Town in his first two games in charge, is targeting for the Cobblers. “Oxford will be very similar to ourselves, in that this is a game they will want to win,” said Curle. “Every competition, whether it’s a five-a-side, they will be looking to get momentum, to get a reaction and to get a win. “They will then hope that will have a snowball effect, a knock-on, effect. Curle wouldn’t say whether or not he will be rotating his team for the short trip across the county border tonight, but he is definitely withouth injured central defenders Ash Taylor and Leon Barnett, as well as striker Junior Morias. Curle is still very much at thge discovery stage when it comes to life as the boss at the PTS Academy Stadium, and he revealed he has been busily trying to get used to his new surroundings. Asked how he is settling in, the former Manchester City and England defender said: “I have seen the training ground, I have seen the hotel, I have seen the stadium. “I went to the town centre and visited the ping-pong parlour and had a game of table tennis with Colin (West, assistant manager) and had a cup of coffee. “After the game on Saturday, on the way back home I collected a few more bits and pieces and now I am back down here. So, how did the ping-pong challenge go? “Colin complained about everything,” said Curle. And Curle would certainly love to savour that winning feeling again tonight. 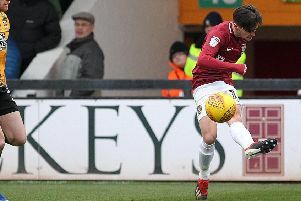 The Cobblers need at the very least need to draw and claim the penalty shootout bonus point from the game if they are to keep alive their hopes of reaching the knockout stage.